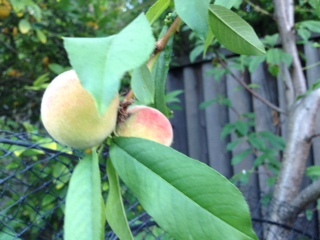 Lots of June sun, a few hot days–and suddenly everything’s rushing to ripeness. 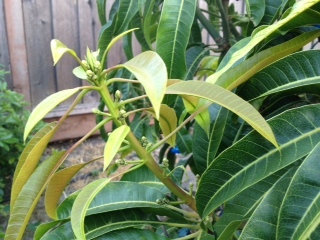 Even the mango tree has decided to try again for a crop this year. Judging by how much time the birds spend not coming to the feeder, I’m guessing the hawks in the redwood are a big reason why my fruit has been pretty much left alone. The cinnamon I sprinkled on top of the fence near the peaches didn’t hurt any, either; a squirrel will not step in it, not if it can help it. I bet you enjoy every minute of it – now and later too. Wow, it all looks great! Natural miracles (with lots of human help, of course). I see lots of folks reaping the benefits of all that bounty! ? 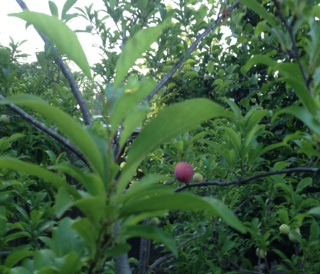 A sour cherry tree! We had one in our backyard for years, until one morning, my mom opened the curtains leading to the yard and the tree horizontal. 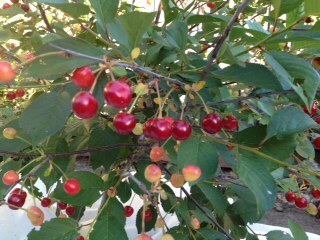 Every year I hit the farmer’s market during the very short sour cherry season, buy many quarts, pit and cook them! I will share with the family if asked VERY nicely. Enjoy them! 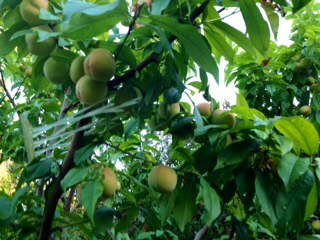 It’s like a treasure hunt going out in the yard at this time of year, isn’t it? !